Hero Splendor lead the pack of motorcycles in terms of sales with 2,44,241 units sold last month. 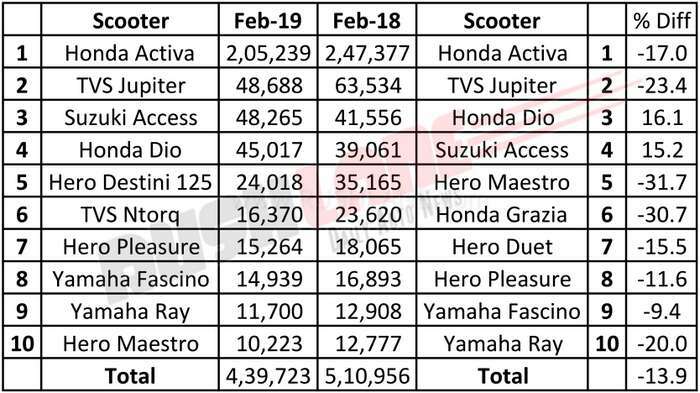 Hero MotoCorp, the country’s largest two wheeler maker, topped the list of top selling motorcycles in India for February 2019, with four of its models on the list. Hero Splendor was at a No.1 spot with 2,44,241 units sold while the Hero HF Deluxe at No. 2 saw sales to the extent of 1,84,396 units. Hero also had the Passion and Glamour at Nos. 5 and 7 with sales of 53,044 units and 46,083 units respectively. 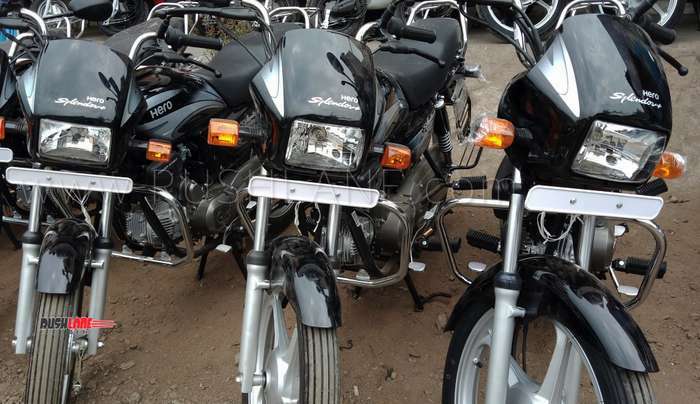 The two wheeler major, with a market share of 39.19 percent, noted a 1.96 percent decline in total sales in February 2019 with sales of 6,17,215 units over sales in the same month of the previous year which stood at 6,29,597 units. A slew of new products are being planned, both in the scooter and motorcycle segment so as to add further impetus to sales in the coming months. Honda saw its best selling model CB Shine at No. 3 on the list of top selling motorcycles in the past month. Sale of this model stood at 86,355 units and was the only offering from the company on the list. Compared to Feb 2018, when the CB Shine registered sales of 82,189 units, this is an increase of 5.1%. Bajaj Auto Limited had three offerings in the form of the Pulsar at No. 4 with 84,151 units sold last month, the Platina at No. 6 with 53,044 units sold and Bajaj CT100 at No. 9 with 37,346 units sold in February 2019. Total sales of the company in the motorcycle segment increased 10 percent from 3,27,985 units sold in the past month as against 2,97,514 units sold in the same month of the previous year. Bajaj Pulsar sales grew from 60,772 units to 84,151 units. Below is a detailed table. Royal Enfield Classic 350, at No. 8 on this list saw total sales of 37,862 units last month. The Classic 350 also got equipped with dual channel ABS and is now priced at a premium of Rs.5,800 over the non ABS variant. The company has reported a 14.3 percent decline in total sales for February 2019 as compared to February 2018 when a total of 71,354 units were sold as against 62,630 units sold last month. TVS Motors had the Apache at No.10 with 35,358 units sold last month. The company’s motorcycle range which consists of commuter and premium commuter bikes ranging from the 110cc models to fully faired 311 cc sports bike the Apache RR 310 noted an 8 percent increase in sales in February 2019. Sales during the past month stood at 1,22,551 units up from 1,13,296 units sold in February 2018. 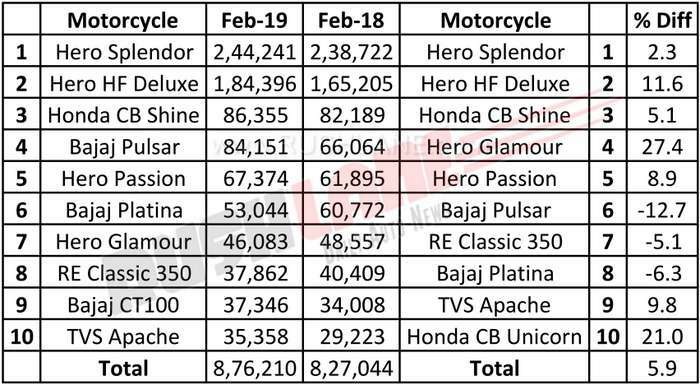 Total motorcycle sales in top 10 stood at 8,76,210 units, for Feb 2019. As against 8,27,044 units sold in Feb 2018, which is a growth of 5.9 percent. Scooter sales registered a decline, which can be seen in the table below. Unlike motorcycle sales, scooter sales registered a decline for the same month.